We arrived at the location and were met by Chuck Andrews, the band’s manager. He led us back to their dressing room where we stored our bins. Around 545pm, we began to suit up and get ready for the patrons. We walked outside and took pics with the fans as well as regular street traffic. The plan was for us to patrol the crowd, take pics, and when the band was about to play “March of the Resistance”, we were to stand in front the barricades and get the crowd pumped. After the show, the band donated signed CD’s for us to use in raffles and charity type fundraisers. All in all, it was a fantastic event. The band and their crew were incredibly nice, and we cannot wait to work with them again. Troopers arrived throughout the event, starting at 3:00 pm. Around 4:00 pm, Event lead and POC gave a event briefing asking all troopers to patrol town, help with fundraising and assist with blast a trooper.Everyone came out of the changing room and posed for a group picture, and then went right to work pointing people in town to the courtyard where the event was taking place. Everyone did a wonderful job. At around 8:00 pm is started to rain, so the troopers made a tactical retreat to the changing room. 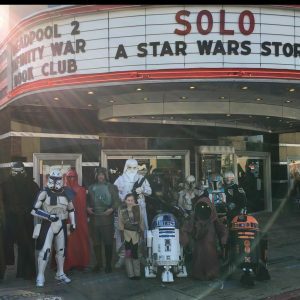 Troopers started to arrive at 4:00 pm, got dressed and went out at 5 to start patrolling the line of people waiting to see the movie. Handed out high-fives and posed for photos with the guests and police. At 6:30, we did the traditional line up and ushered in everyone. At 7:00 pm we de-kitted, got snacks and drinks and watched Solo! Traffic was really bad and we did not have someone to cover the second showing but Bob M. stepped up and got into kit for the people waiting in line after the movie was over. Troopers arrived between 430-530pm and we were shown to a private room upstairs to change and leave our bins. At 6pm, we hung out in the lobby waiting for people to arrive for the first showing. Traffic was a little slow until 7pm, but then there were plenty of people coming in and we posed for many photos and selfies. After another hour or so everyone was in the theater and the lobby emptied out, so we headed back to our room to de-kit. The theater graciously provided us with free tickets to one of the evening shows. A quick troop, but a fun one! Thanks to GC troopers for coming out and supporting this! 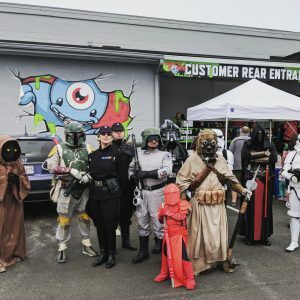 The 10th anniversary of Third Eye Comics was a spectacular event with Imperial citizens crowding the parking lot of Third Eye Comics new bunker location on the forest moon not far from the Imperial Capital, the size of their new facilities rivaling the Death Star’s main hangar. The Third Eye Comics staff were very supportive and provided considerable space for the Garrison to suit up, ensuring we were also well caffeinated, fed and kept hydrated throughout the morning and afternoon. As a result, Garrison members were ready to deploy on time and greet the long, orderly line of eager Imperial younglings and their enthusiastic parents already formed up and receiving their free comic books. We were even treated to a scene reenactment from The Last Jedi shortly into the event, between our GA Praetorian Guard, Ollie, and a young Rey that entertained all the attendees. The crowds stayed consistent throughout the morning thinning out by noon. Although I’m sure our desert dwelling denizens wouldn’t have minded; but fortunately for our armored troopers, the day remained overcast and temperatures were moderate with the rain holding off until near the end of the event. We started arriving at 2:30pm and were shown to a room where we were to change and store our belongings. At 4 we were all ready and headed down to take photos with stadium staff and families. Gates opened at 5pm and we spread out around the picnic area where only fans with tickets were allowed to enter. Posed for photos until 7pm then went back to room for undress. Team had food waiting us when we got there. Most ended the night there, a few redressed and went to the “kids corner” to pose for more photos. 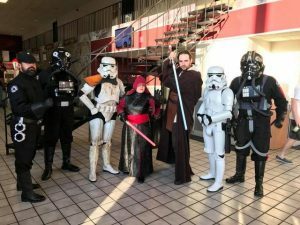 The 501st Legion is the premier Star Wars costuming group in the world. No matter where you live, chances are the 501st presence can be felt. Spanning all 50 States, and over 21 countries worldwide, we are quickly dominating the planet. Our numbers increase daily and recruiting is at an all time high. The Rebellion will soon be eliminated and peace will be restored to the planet. 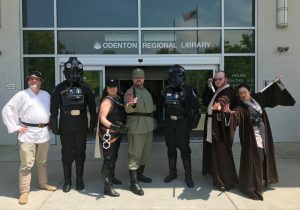 Old Line Garrison is growing by leaps and bounds in the 501st Legion, and will be planning several appearances at conventions and charity events throughout the Maryland and Washington D.C. area. You can check out our news area for regular listings of fund raising and convention appearances. 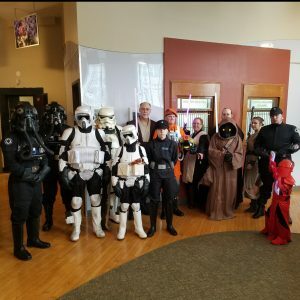 Read all about the worlds largest Star Wars costume organization, the 501st Legion, and if your bucket can withstand repeated raids on this planet’s sector, join us! Stormtrooper? Bounty Hunter? Sith Lord? Biker Scout? TIE Pilot? How about some Imperial Informant scumbag from Tatooine? There’s room for YOU in the 501st. 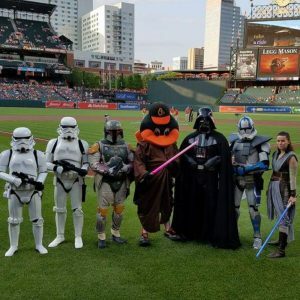 Should you live in the State of Maryland, you’ll be assigned to a rapidly growing detachment capable of taking on the ever-proliferating Rebel scum without breaking a sweat. Click here to join the Old Line Garrison and take your first step towards the Dark Side!